Jonathan Dumont, Deass : Put Your Fox on Fire! Imagine a Workshop based on the Choose your Own Adventure series with the main topic being "Why Firefox?" 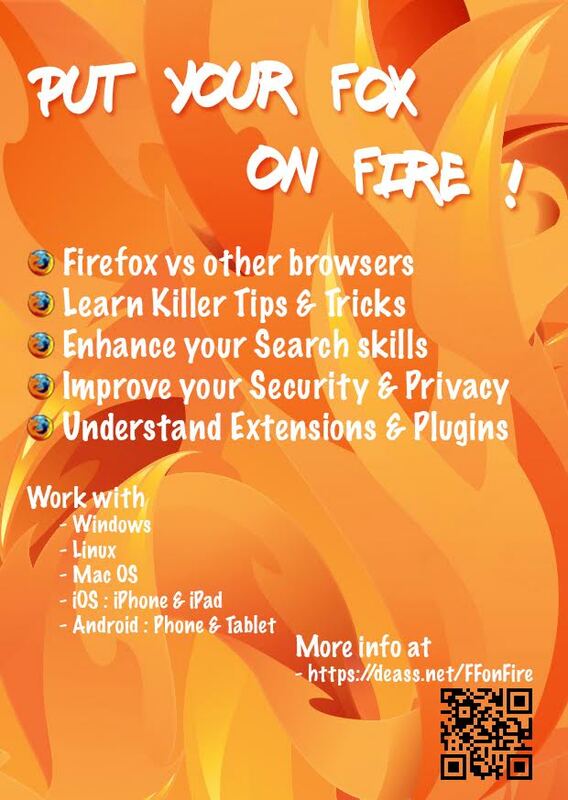 The workshop covers the following topics: Tips and Tricks when using Firefox, security and privacy, improving your search abilities and understanding what extensions & plug-ins are and choosing the right ones to use. BIO: Jonathan Dumont has been on a computer since Nineteen Eighty-Four, an avid Internet user since 1996, and works in IT. Formally trained in Systems Administration and certified as an Ethical Hacker, Jonathan believes everyone should be digitally able and aware. He chose Firefox a long time ago because it was not only available on a portable version which makes it usable on a USB key, but also because FF is an open source project and multi-platform which means it can be used on Mobile,Linux, Mac, Windows, the possibilities are endless.